Let’s take two fictitious singles, Alice and Barry, who are both from Vancouver and work for B.C. Hydro, a utility company. They each have $20,000 in savings and they both want to move closer to work. Alice plans to rent while Barry plans to buy. Alice manages to find a suitable apartment that’s located very close to her job. It only takes her 5 minute to walk to work. 😀 She decides to invest her $20,000 of savings into the stock market. Location: 7418 Byrnepark Walk, Burnaby B.C. Here is the actual listing on Craigslist I found. The move-in date is not until Sept 1st, 2014. 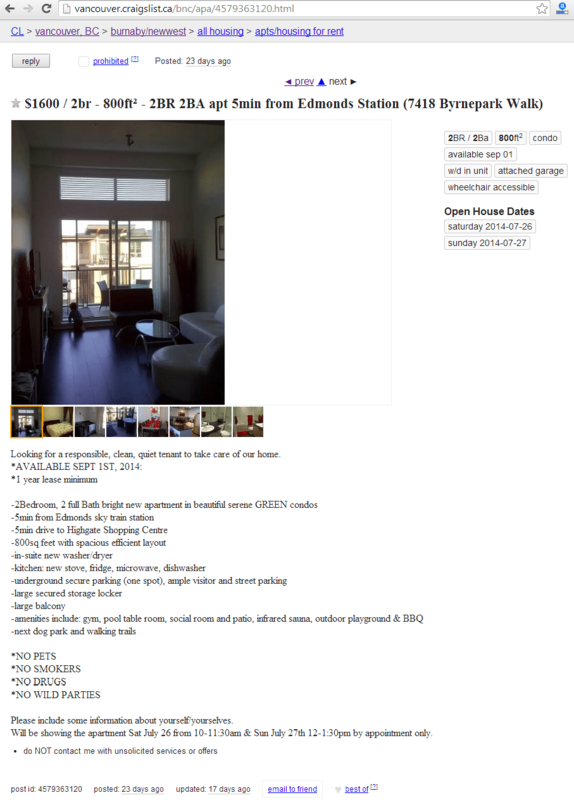 So this is a real life housing situation that could happen to someone in Vancouver right now. Click on image to biggify. Meanwhile, Barry also finds a place to buy, coincidentally in the exact same building as Alice, and also has the same number of bedrooms and bathrooms. 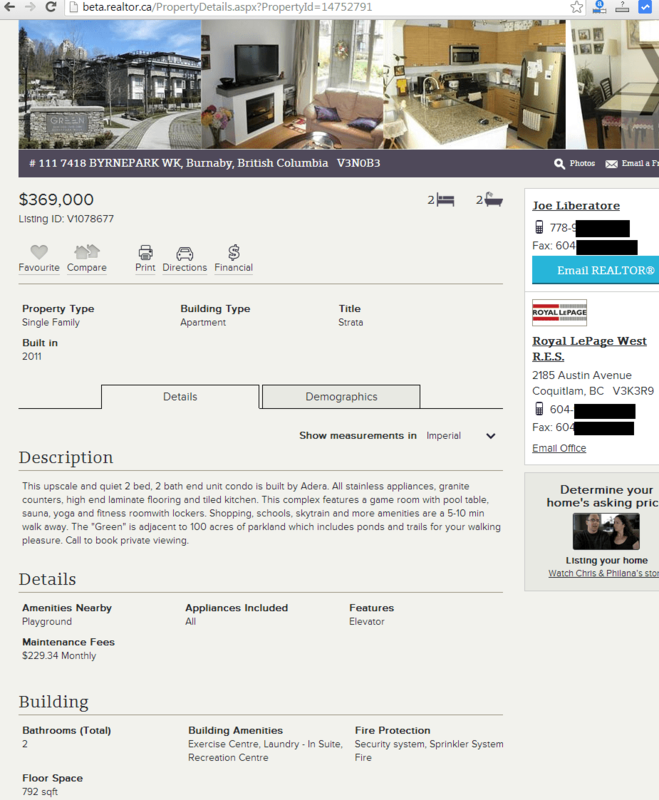 Here is the direct link to the actual listing on realtor.ca.I’ve taken a screenshot as well in case the listing is removed in the future. This is why a typical condo in Greater Vancouver costs $369,000. It HAS to cost this much in order to stay competitive with rental rates. Condo prices aren’t falling because lower prices would lead to lower mortgage payments, and it’s simply not rational for people to rent a place when it costs a lot less to easily own another (almost identical) unit in the same building.